3/35: West Bay Beach, the house is just 5 minutes from unbeatable snorkelling, restaurants, bars and dive centres. 6/35: Plenty of kitchen counter space. 8/35: Wifi & local cable t.v. included. 9/35: Comfortable open plan living. 10/35: The beach 20 steps from the front door. 12/35: Living room with local cable t.v. and wifi. 13/35: View from the dock in front of West Bay Village. 14/35: Well equipped and spacious kitchen. 15/35: Great kitchen for entertaining. 17/35: Our village map We are second back from the beach front on the right. 20/35: Master bedroom with king bed. 21/35: There is a private deck off master bedroom with outside shower. 25/35: Guest bedroom, perfect for a second couple with queen bed and en-suite bathroom. Also perfect for kids and teens or groups of singles as we have 2 extra bunks. 28/35: Queen bed & two bunks in guest bedroom. 29/35: Guest room sleeps 4. 30/35: Guest bathroom with tub/shower combo. 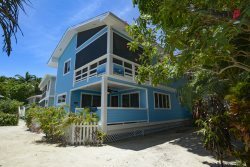 33/35: Satori Beach, ground floor beach cottage just 20 steps from the Caribbean Sea. 35/35: Walkway to the beach and turquoise waters of West Bay. Relax in Caribbean style at Satori Beach, this 2 bedroom home is just 20 steps from the perfect Caribbean waters. Take in great ocean views from the large open deck while you sip a cool drink or catch up on your reading. The gentle breezes help keep you comfortable and happy. Our unbeatable location is within 5 minutes walk of some of the best snorkeling, restaurants and dive shops the island offers. Put on your mask and snorkel or dive gear and commune with beautiful fish or float away to your heart’s content on a raft. Then have some coconut shrimp and local conch chowder, topped off with Key lime pie and sway to island rhythms with local bands. Or…stay in and do nothing at all but relax! The Satori Beach master bedroom has an outdoor garden deck with soft lighting, beautiful planting and Bali shower for a refreshing break. The master bedroom has a comfortable brand new Serta king mattress for a dreamy sleep. Tumbled limestone graces the counter tops and the unique walk-in shower of the attached large bathroom. The guest suite has a pillow top queen bed and an additional 2 bunk beds are available. Perfect for a second couple or for your kids! The en-suite bathroom has double sinks and tumbled limestone shower and counter details. Chefs and diners alike will love the fully equipped gourmet kitchen with slab granite counters, stainless steel appliances and custom cabinets of Honduran rosewood. Purified water for cooking and drinking is at your fingertips. Beautiful location, perfect for families. House was very comfortable and had everything that we needed. We did experience water pressure/temperature issues that were remedied towards the end of our stay but other than that, accommodations were great! REPLY: Thank you very much, nice to have you back! Enjoyed our stay. Comfortable and quiet. REPLY: Thank you very much, please come see us again! Great location, beautiful home, i will go back year after year ,,,,, Also my employes Like Tony Oliva will be staying at one of your home as a incentive program that we have, he going in today Sep. 21 2017, we are recommending your home sincerely. This time the AC was on so great change from last year... REPLY: Thank you, it is always nice to have you back! Beautiful houses ! incredible environment. They are great. We have been coming there for 3 years. Love it and they know us. We traveled with 50 + people and Island House Rentals made everything easy. Everyone had awesome accommodations and they handled the individual transactions as to make it much easier for me. I travel to Roatan at least 2 times a year and will call on Ruth, Brad, Ryan and the gang in the near future. The staff was very good to work with and the property security is very good at watching your chairs and stuff as you go into the water at the beach. Very easy to work with, very accommodating. Friendly great experience. Stayed in the two bedroom Satori house. Had a wonderful vacation can't wait to come back. the Island House Vacation Rental team has always been most friendly and helpful,. Whenever we needed something or assistance they were always there to help out. We had another enjoyable 3 week vacation at Upper Barefoot Dream in West Bay Village and look forward to 4 weeks in the Village next year. Ryan was very friendly, professional and informative! He was an excellent host. We will definitely be returning to these properties on West Bay Beach. We stayed here last year in July. Loved it. We go there once a year. We are staying here again in June. Love the house and it is a relaxing place to be. Also going in Dec 2016 and staying in another house there. We always stay at West Bay Village. No Better Place To stay. Rates do not include 19% Honduran tax, but 'instant quote' will. Extra bunks for 2 an additional $30 per person per night.